At least three Turkish soldiers have been killed in an air strike in northern Syria. It happened at around 3am local time during the course of a Turkish-led Syrian rebel operation, according to a statement from the Turkish military. Ten soldiers have been wounded, one of them seriously. They have been taken to hospital. If fully confirmed, it would be the first time Turkish soldiers are known to have been killed in the offensive, dubbed “Euphrates Shield”, which was launched on August the 24th. Do they know who is responsible? The Turkish military statement says the strike is thought to have been carried out by Syrian government forces. Earlier, security and hospital sources in Turkey said ISIL fighters carried out an attack which killed three Turkish soldiers in the al-Bab region. 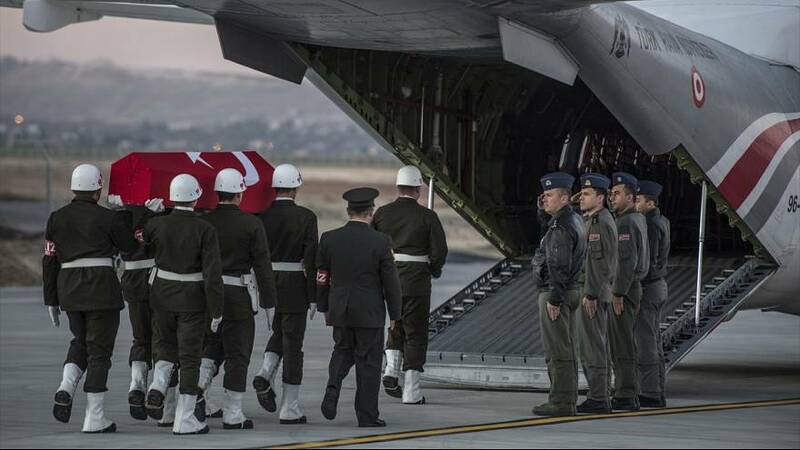 They said the wounded soldiers were transferred to hospitals in the Turkish border province of Kilis and Gaziantep. Prime Minister Binali Yildirim says Turkey will retaliate against the attack. “Turkey has been fighting against ISIL. This attack will surely have a retaliation,” Yildirim said. Has there been any comment from the Syrian government? However, it said in October the presence of Turkish troops on Syrian soil was a “flagrant breach of Syria’s sovereignty” and warned it would bring down Turkish warplanes entering its airspace. The Turkish-backed rebels have clashed with Syrian government forces before, including in late October. This is when a suspected Syrian government helicopter bombed their positions near Dabiq, a former ISIL stronghold. However, Wednesday night’s clash was the first time the Turkish military has said its own soldiers were killed by Syrian forces since Euphrates Shield began. The attack also comes on the first anniversary of Turkey shooting down a Russian warplane over Syria. This prompted a lengthy diplomatic rift between Moscow and Ankara, which only ended in August. Moscow is a major military backer of Assad. The operation aims to push ISIL fighters and the Kurdish YPG militia away from the Syrian side of Turkey’s border. It was launched three months ago. It has advanced to near the city of al-Bab, which is controlled by jihadists.